The proclamation of the criers on the approach of Joseph (Gen. xli. 43). It has been variously explained. Some favor an Egyptian origin, others a Semitic one. Jewish commentators derive it from barak (to bend the knee) and recognize in it a hiphil formation. The general opinion of scholars at present is in favor of Semitic origin. Delitzsch ("Hebrew Language," p. 25) refers it to the Assyrian abarakku (a titled person-age), which has much in its favor. The El-Amarna tablets prove the possibility of a Semitic word finding its way into Egypt at an early date. 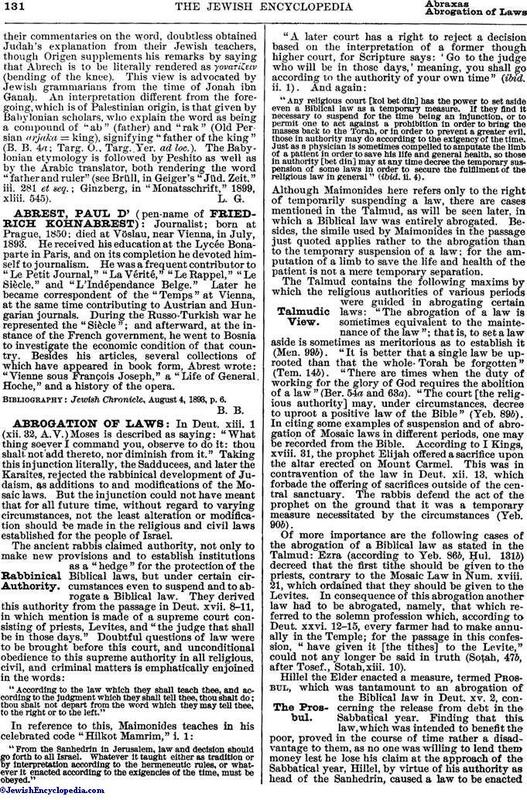 The term Abrech, which occurs only once in the Scriptures, engaged the attention of the rabbis from an early date. The following two explanations were given in the middle of the second century of the common era: Judah b. Ilai considered Abrech as a compound of (father) and (tender), and explained Joseph's title to mean one who is a father in wisdom but young in years. This explanation was held by Judah's contemporary, Jose, "son, of a woman of Damascus," to be a perversion of words. 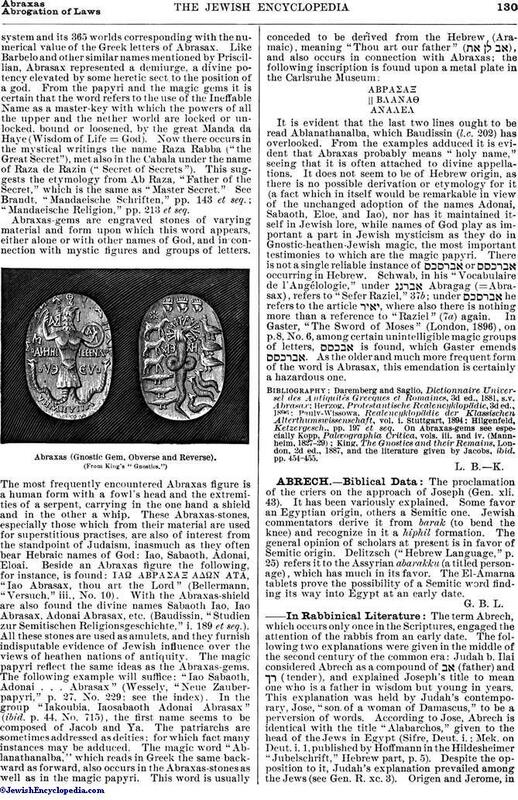 According to Jose, Abrech is identical with the title "Alabarchos," given to the head of the Jews in Egypt (Sifre, Deut. i.; Mek. on Deut. i. 1, published by Hoffmann in the Hildesheimer "Jubelschrift," Hebrew part, p. 5). Despite the opposition to it, Judah's explanation prevailed among the Jews (see Gen. R. xc. 3). Origen and Jerome, intheir commentaries on the word, doubtless obtained Judah's explanation from their Jewish teachers, though Origen supplements his remarks by saying that Abrech is to be literally rendered as γονατιζειν (bending of the knee). This view is advocated by Jewish grammarians from the time of Jonah ibn Ganaḥ. An interpretation different from the foregoing, which is of Palestinian origin, is that given by Babylonian scholars, who explain the word as being a compound of "ab" (father) and "rak" (Old Persian arjaka = king), signifying "father of the king" (B. B. 4a; Targ. O., Targ. Yer. ad loc.). The Babylonian etymology is followed by Peshito as well as by the Arabic translator, both rendering the word "father and ruler" (see Brüll, in Geiger's "Jüd. Zeit." iii. 281 et seq. ; Ginzberg, in "Monatsschrift," 1899, xliii. 545).